A small low growing species Grevillea baueri subsp. Asperula is dense growing and free flowering. This is a Grevillea that provides good foliage through the year, masses of small flowers and a great habitat for small birds. The flowers are spidery in form and attract bees and birds to the garden. This is a species that could be used as a low hedge or birder plant, in this situation plant at around 1 metre apart for a good coverage. The species itself G. baueri is also available. 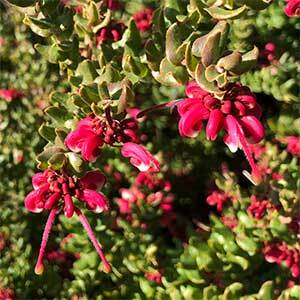 Best planted in full sun in a well drained soil, Grevillea baueri requires little extra care once established. When planting ensure that drainage is good and provide some extra water through the first summer. A little native plant fertiliser in spring will be beneficial in poorer soils. In dry summers or dry autumn periods some extra water will improve flowering. Light pruning directly after flowering improve the appearance of the plant and maintain a more compact busy habit. Flowers – Deep pink to red. Foliage – Mid green, oblong to around 3 cm.